Takashi Katsuki, a researcher at Antivirus firm Symantec has discovered a new cyber attack ongoing in the wild, targeting an open-source Web server application server Apache Tomcat with a cross platform Java based backdoor that can be used to attack other machines. The malware, dubbed as "Java.Tomdep" differs from other server malware and is not written in the PHP scripting language. It is basically a Java based backdoor act as Java Servlet that gives Apache Tomcat platforms malicious capabilities. Because Java is a cross platform language, the affected platforms include Linux, Mac OS X, Solaris, and most supported versions of Windows. The malware was detected less than a month ago and so far the number of infected machines appears to be low. You may think that this type of attack only targets personal computers, such as desktops and laptops, but unfortunately that isn’t true. Servers can also be attacked. They are quite valuable targets, since they are usually high-performance computers and run 24x7. 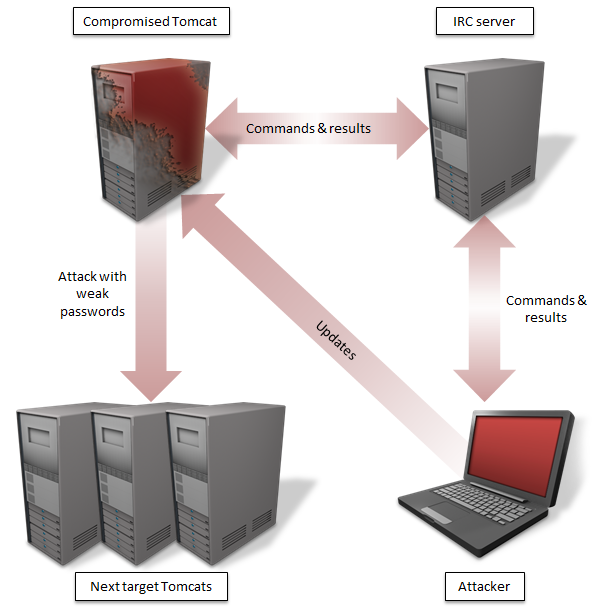 Java worm seeks out for the system having Apache Tomcat installed-running and then attempts to log-in using the password brute-force attack using combinations of user names and passwords. After installation, the malware servlet behaves like an IRC Bot and able to receive commands from an attacker. Malware is capable of sending-downloading files from the system, create new processes, update itself, can setup SOCKS proxy, UDP flooding i.e. Can perform massive DDoS Attack. They have mentioned that the command-and-control servers have been traced to Taiwan and Luxembourg. In order to avoid this threat, ensure that your server and AV products are fully patched and updated.